00:39:00 10 servings, 3 topped cabbage leaves each. 10 servings, 3 topped cabbage leaves each. Add a little kick to the table with this recipe for Spicy Korean BBQ Meatballs. 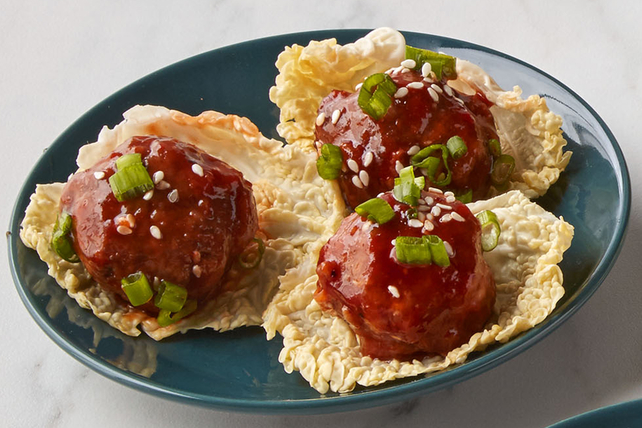 A variety of ingredients add depth to this easy-to-make take on Korean BBQ meatballs. Mix meat, stuffing mix, milk, egg and 1/4 cup of the chili sauce mixture just until blended. Shape into 30 (1-1/2-inch) meatballs. Place on foil-covered rimmed baking sheet sprayed with cooking spray. Bake 12 to 14 min. or until done (160ºF). Meanwhile, cook remaining chili sauce mixture in saucepan on medium-low heat until heated through, stirring occasionally. Remove from heat. Place meatballs in large bowl. Add chili sauce mixture; toss to evenly coat meatballs with sauce. Spoon 1 meatball onto each cabbage leaf. Sprinkle with onions and sesame seed. For milder flavour, reduce the sweet chili sauce to 1/2 cup. When selecting the cabbage leaves, use the inner leaves for best results. If leaves are too long, trim off the tips until leaves are about 3 inches long. Serving Size 10 servings, 3 topped cabbage leaves each.